To commemorate the upcoming release of Bokujou Monogatari: Kimi to Sodatsu Shima (Island of Happiness), the Japanese children's magazine Shogaku San-Nen-Sei has published a 16-page manga story, drawn by the official Harvest Moon character illustrator, Igusa Matsuyama. 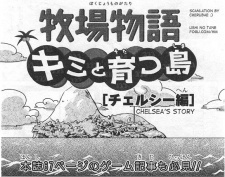 The first chapter appears in the magazine's January 2007 edition, with a follow up chapter in their February edition. Mark has crash landed on an island, and helps out the local family that took him in to start their first year of growing crops. Chelsea accidentally hires two robbers, but they do a really good job of helping her out around the farm, and leave to become better people.